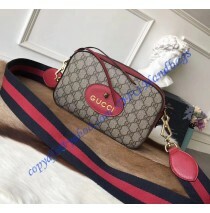 Recently, Gucci released several bags that are based on a traditional and vintage direction. The Gucci GG Supreme messenger bag with Brown and Yellow Leather Trim bag is one of them. It is made of supreme GG canvas, it comes with the red and green web and it has a cotton lining, which makes it a bit different. Besides all of this, you also get brass hardware and the adjustable shoulder strap with a drop of 20 inches. We liked a small skull Gucci label added to the exterior. It makes the bag look even more desirable. The handles you can see are a bit special. They are based on vintage models and they come from the time artisans used to add any available handle for a bag in order to repair it and make it functional for a longer period of time. This is the main reason why you get the handles of this kind. Inside you will see plenty of space. It features an open compartment which is massive for all items you will ever have to carry in this bag. In addition, the cotton lining will make all your items extremely safe and prevent any scratches. 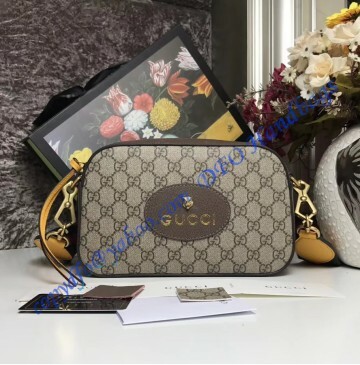 So, what we have to add about the Gucci GG Supreme messenger bag with Brown and Yellow Leather Trim bag? It is suitable for women who have busy lifestyles and who are looking for a compact bag with the highest quality possible. It is also the top choice of all of you who are looking for vintage fashion accessories. In that case scenario, we can add that Gucci is the leader and the main fashion house to consider. And yes, the beige and ebony canvas has a low impact on the environment, as you may know.